Chrome alum (chromium alum) is a safe salt that produces beautiful natural purple crystals. 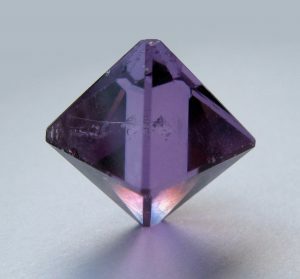 The octahedral crystals are easy to grow, plus you can control how dark they are, to produce crystals ranging from pale lavender to deep amethyst purple. To get purple chrome alum crystals, you only need chrome alum [KCr(SO4)2 ] and hot water, however, if you add regular alum (ammonium aluminum sulfate), you will get crystals that are more stable and also more translucent. Regular alum is sold as a pickling or canning spice in grocery stores or as a styptic chemical (to stop bleeding from small cuts) in some pharmacies. It comes as a white powder or white granules. It’s not as easy to find chrome alum, which is a purple crystalline powder, although it is available online and may be found as a chemical used in leather tanning. Prepare a saturated solution of alum (just chrome alum or a mixture of the two salts) by dissolving as much alum as you can in a small cup of very hot water. The water does not need to be boiling. Very hot tap water or water from a coffeemaker is a good temperature. You can measure 60 grams of alum in 100 milliliters of water or else just keep stirring in alum until it stops dissolving. The solution will be blue-green in color, but the crystals will be purple. Get a seed crystal by pouring a small amount of this solution onto a small saucer. You should have crystals within a few hours or overnight. Select one or more of the best crystals as seeds to grow larger chrome alum crystals. Place the selected crystals in a clear cup or bowl and cover them with your crystal growing solution. As the solution evaporates, it will become more concentrated and the crystals will become larger. Remove the crystals and place them on a paper towel to dry. You may wish to scoop out the crystals with a spoon or else use a gloved hand or else the solution will color your fingers.